Kigawa Kōgaku was a Japanese camera maker, appearing in the mid-1930s. The associated distributor in the 1930s and early 1940s was called Optochrom-sha, Nichiei Shōkai then Kikō Shōji. After 1945, the company was briefly renamed Shin Nippon Kōgyō, before using the name Kigawa Kōgaku again. It was renamed Carl Kōgaku in 1952, and disappeared the following year. The company name Optochrom-sha (オプトクローム社) appears in advertisements as early as February 1937, maybe from 1936. The address was Tōkyō, Nihonbashi, Honchō 1–5 (東京・日本橋・本町一ノ五). Optochrom sold a range of cameras using 120 or 127 film, most having some variation of the brand names "Chrome" and "Tsubasa". 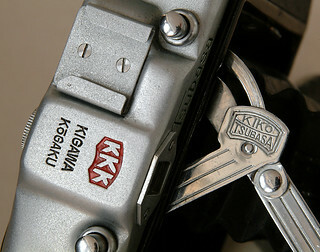 It is said that the maker of the cameras was already called Kigawa Kōgaku (木川光学) in that period, and a K.A logo is said to correspond to Kigawa Association (木川アソシェーション), a group formed by Kigawa Kōgaku and Optochrom-sha. The name Tsubasa is also found on various accessories sold by the distributor Matsuzaki Shashinki-ten, like the Tsubasa lens hood and the Tsubasa self-timer. It seems that these accessories were made by Tōkyō Shashin Kōgaku, a company which also made the Baby Germa and Semi Germa cameras, distributed by Kigawa. The name Optochrom-sha was used at least until March 1941. In November 1941 and January 1942, the sales company was called Nichiei Shōkai Honten (日英商会本店), at the same address. The name means "Anglo-Japanese sales company", which is remarkable at a time when military-ruled Japan was allied to Germany, in war with Great-Britain. It seems that at least some anglophile people were ruling the company, and this also appears in the name of the Tsubasa Kiko Three, which was engraved in English as Kiko Three on the early examples of the camera. At the time, the company was also acting as a distributor of the Lausar lenses by Tomioka. The name of the sales company became Kikō Shōji Gōshi-gaisha (木光商事㈾) in February 1942; this clearly derives from Kigawa and Kōgaku. This company has the same address as the former Optochrom-sha. In November 1941, the manufacturer was called Kigawa Seimitsu Kōgaku Kikai Seizōsho (木川精密光学機械製造所, i.e. Kigawa precision optical instruments factory), a name still in use in July 1943. The first factory was in Oku, Arakawa-ku (荒川・尾久), and the second in Nezu, Hongō-ku (本郷・根津). The company made some cameras with the name "Kiko". It abandoned the models using 127 film and concentrated on 4.5×6 and 6×6 folders. The last ones, the Kiko Semi and the Gotex, were advertised until 1944. The company was recreated under the name Shin Nippon Kōgyō K.K. (新日本興業㈱) in April 1946. It is said that the name was changed because the company wanted to keep a low profile because of its past involvement in the Japanese war effort. The Kiko Semi 4.5×6 folder was offered again in mid-1946, but no company name is visible on the advertisements. In 1948, the address of Shin Nippon Kōgyō was Bunkyō-ku Nezu Yaegaki-chō Denteimae in Tokyo (東京都文京区根津八重垣町電停前). It was selling the Gotex with newer SNK markings, and it later made the Poppy Six, derived from the Gotex, and the Poppy subminiature. The Poppy Six certainly evolved into the Minon Six made by Yamato Kōki Kōgyō in the 1950s, but the nature of the relationship between the two companies is unclear. In 1952, the company was renamed Carl Kōgaku K.K. (カール光学㈱), with the same address. It produced the Carl Six for about a year, and made the Carlflex 6×6cm SLR prototype before disappearing completely. A Rosen postwar camera has been observed that seems related to the Tsubasa Semi F.
The Sun B Hit-type camera is marked S.N.K. Camera Works, and was perhaps made by Shin Nippon Kōgyō too. ↑ On the markings observed, the company used the spelling "Optochrom", not "Optochrome". ↑ The earliest advertisement for the Baby Chrome listed in Kokusan kamera no rekishi, p.336, is dated October 1936. An advertisement by Optochrom dated February 1937 is reproduced in the same source in two parts, on pp.61 and 70. ↑ Advertisements dated February 1937 to March 1941 reproduced in Kokusan kamera no rekishi, pp.70 and 78–9. ↑ Maker already called Kigawa Kōgaku: extract of Kamera no ayumi, reproduced in Furukawa, p.5 of Camera Collectors' News no.261. Meaning of the K.A logo of the Semi Sixteenth: Furukawa, p.7 of the same article. 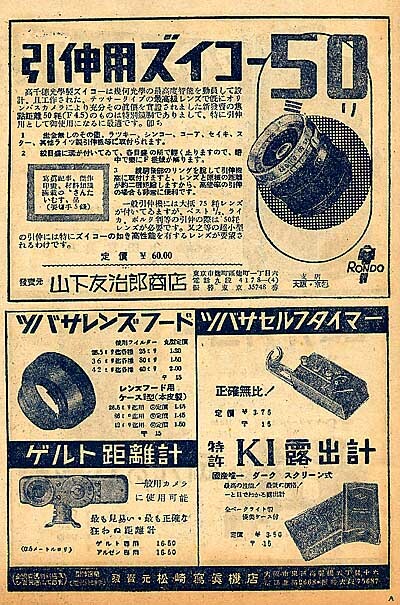 ↑ Advertisement in Asahi Camera April 1940, reproduced in Kokusan kamera no rekishi, p.79. ↑ For example an advertisement dated June 1937 formerly reproduced in the Gochamaze website (archived) and this advertisement dated 1941 reproduced in Nostalgic Camera by Toshio Inamura. ↑ An advertisement published in Ars Camera October 1938 and cited in Kokusan kamera no rekishi, p.336 says that "Tōkyō Shashin Kōgaku Kōgyōsho" (sic) was the maker of the Tsubasa products (ツバサ製品), presumably the accessories. ↑ "Kokusan shashinki no genjōchōsa" ("Inquiry into Japanese cameras"), items 65 and 167. ↑ Advertisement dated March 1941 reproduced in Kokusan kamera no rekishi, p.79. ↑ Advertisement dated November 1941 reproduced in Nakamura, p.29 of Camera Collectors' News no.173 (the same advertisement is dated June 1941 in Onodera, p.18 of Camera Collectors' News no.127, perhaps by mistake); "Kamera no kōtei kakaku kanpō happyō", November 1941, dated November 1941; advertisement dated January 1942 reproduced in Kokusan kamera no rekishi, p.68. ↑ Advertisement (date unknown) reproduced in Inoue, p.130 of Kurashikku Kamera Senka no.14. ↑ Advertisements dated February 1942 to July 1943 reproduced in Kokusan kamera no rekishi, pp.66 and 71. ↑ Advertisement dated November 1941 reproduced in Nakamura, p.29 of Camera Collectors' News no.173 (the same advertisement is dated June 1941 in Onodera, p.18 of Camera Collectors' News no.127, perhaps by mistake); advertisements dated January 1942 to July 1943 reproduced in Kokusan kamera no rekishi, pp.66, 68 and 71. The address of the Oku plant in 1943 was Tōkyō, Nihonbashi, Oku-chō 8–1130 (東京都荒川区尾久町8–1130). Source: "Kokusan shashinki no genjōchōsa" ("Inquiry into Japanese cameras"). The company is inaccurately called "Kigawa Seimitsu Kikai Seisakusho" in this source (木川精密機械製作所). ↑ The last advertisement for the Gotex mentioned by Kokusan kamera no rekishi, p.336, is dated December 1944. ↑ It is unrelated to the company Shin Nippon Kōki K.K. (新日本工機㈱), founded in 1949 according to its official website. ↑ 16.0 16.1 Furukawa, p.2 of Camera Collectors' News no.156. ↑ Advertisements in Ars Camera May 1946 (p.3) and July 1946 (p.29). That dated May is reproduced in Kokusan kamera no rekishi, p.132. ↑ Advertisement on the third cover of Nihon Shashin Kōgyō Tsūshin, April 20, 1948, reproduced on p.85 of Hyaku-gō goto jūkai no kiroku. ↑ Advertisements dated from December 1950 to January 1952 reproduced in Kokusan kamera no rekishi, pp.136 and 148–9. The exact address was Tōkyō-to Bunkyō-ku Nezu Yaegaki-chō 28-banchi (東京都文京区根津八重垣28番地). ↑ Advertisements dated from July 1952 to April 1953 reproduced in Kokusan kamera no rekishi, p.131. ↑ The last advertisement for the New Carl Six mentioned by Kokusan kamera no rekishi, p.349, is dated April 1953. Ars Camera. Advertisements in May 1946 (p.3) and July 1946 (p.29). Asahi Camera (アサヒカメラ) editorial staff. Shōwa 10–40nen kōkoku ni miru kokusan kamera no rekishi (昭和10–40年広告にみる国産カメラの歴史, Japanese camera history as seen in advertisements, 1935–1965). Tokyo: Asahi Shinbunsha, 1994. ISBN 4-02-330312-7. Items 57–8, 75, 101, 143–52, 462–3, 471, 503, 606–8. Furukawa Haruo (古川保男). "Gurēsu shikkusu" (グレースシックス, Grace Six). In Camera Collectors' News no.156 (June 1990). Nishinomiya: Camera Collectors News-sha. Furukawa Haruo (古川保男). "Semi Sixteenth '16×2=32, 16×3=48'". In Camera Collectors' News no.261 (March 1999). Nishinomiya: Camera Collectors News-sha. Pp.5–9. Kanno Tsunetoshi (管野経敏). "A kara Z no kokusan niganrefu" (AからZの国産二眼レフ, Japanese TLRs from A to Z). In Miryoku saihakken: Nigan refu: Firumu kamera ha e no messēji (魅力再発見・二眼レフ：フィルムカメラ派へのメッセージ, Fascination rediscovery: TLRs: A message to film cameras). Tokyo: Shashinkogyo Syuppansha, 2006. Kawamata Masataku (川又正卓). "Carl-6." In Supuringu kamera de ikou: Zen 69 kishu no shōkai to tsukaikata (スプリングカメラでいこう：全69機種の紹介と使い方, Let's try spring cameras: Introduction to and use of 69 machines). Tokyo: Shashinkogyo Syuppan-sha, 2004. ISBN 4-87956-072-3. Pp.116–7. On the relationship between Kigawa and Carl. McKeown, James M. and Joan C. McKeown's Price Guide to Antique and Classic Cameras, 12th Edition, 2005-2006. USA, Centennial Photo Service, 2004. ISBN 0-931838-40-1 (hardcover). ISBN 0-931838-41-X (softcover). Pp.464–5 and 890. Nihon Shashin Kōgyō Tsūshin (日本写真興業通信). Hyaku-gō goto jūkai no kiroku (百号ごと十回の記録, Ten records, every hundred issues). Tokyo: Nihon Shashin Kōgyō Tsūshin Sha (日本写真興業通信社), 1967. No ISBN number. Advertisement on p.85, corresponding to the third cover of the April 20, 1948 issue. Onodera Eiri (小野寺英里). "SNK to Kigawa to Taisei to Fujikō to" (SNKと木川と大成と富士光と, SNK, Kigawa, Taisei, Fujikō, etc.). In Camera Collectors' News no.127 (January 1988). Nishinomiya: Camera Collectors News-sha. Pp.15–20. This page was last edited on 22 January 2019, at 11:44.